Anyone who watched season five of FX's Archer knows that the cocaine-fueled season was quite a departure from the show's typical secret agent vibe. At San Diego Comic Con, creator Adam Reed stated that the next season would be a return to ISIS for Archer and his colleagues. According to Deadline, the first episode of the next season--which was met with "defeaning cheers and laughs"--will have the ISIS spy gang going back to a "digitized version" of their familiar office. Of course, things aren't exactly the same as they were before Archer: Vice, as the fifth season was appropriately called: Lana's got a new baby, and Archer is continuing to deal with the fact that he might not be a completely awful person. Season five was "a vacation" for Reed, joking that the drug-running storyline ended because "we ran out of cocaine," but the events will still have ongoing consequences. 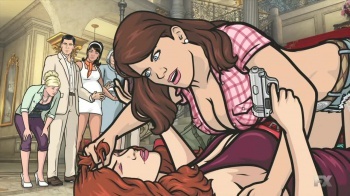 Archer will return to FX in 2015.